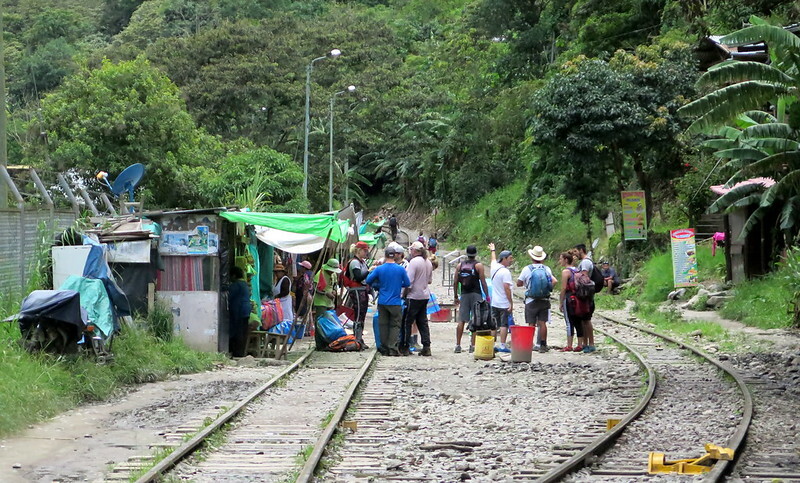 Visitors ask locals for directions to Machu Picchu at the start of the railway in Hidroelectrica. FAfter our evening of food, hot springs, and rest in Santa Teresa, we woke up ready to tackle the last leg of our journey to Machu Picchu. 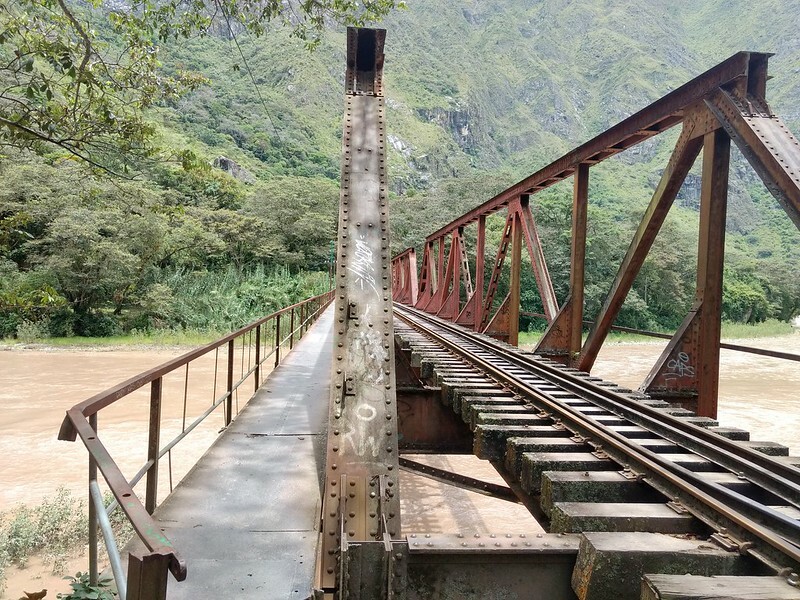 Because we couldn’t afford the insane $200 price tag for the train to and from Aguas Calientes (the town that serves as the base for visiting Machu Picchu), our only option is to walk from the relatively nearby town of Hidroeléctrica along the train tracks to Aguas Calientes. 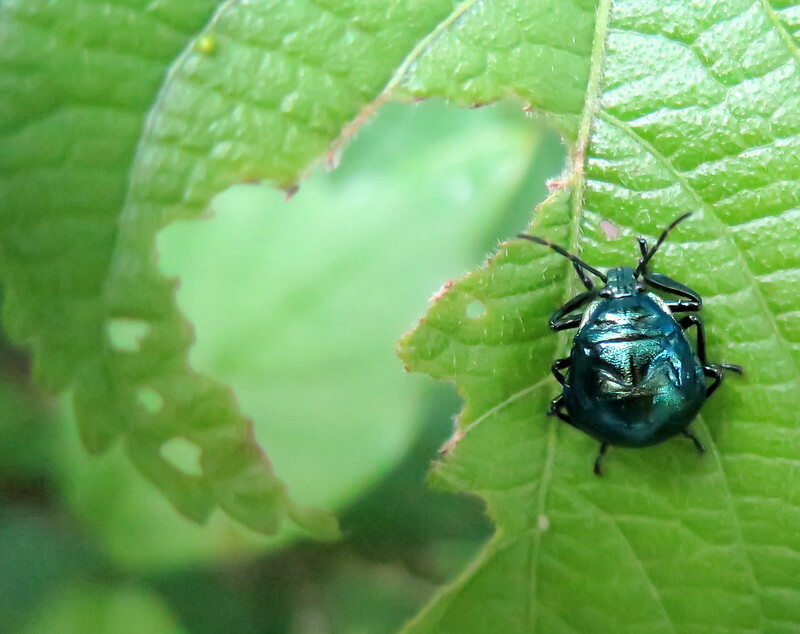 It’s something that a lot of backpackers do, so we figured we’d be in good company. Our trail supplies (plus water and some trail mix). Note that the Sublime is actually an amazing chocolate bar for the price, with decent quality chocolate. 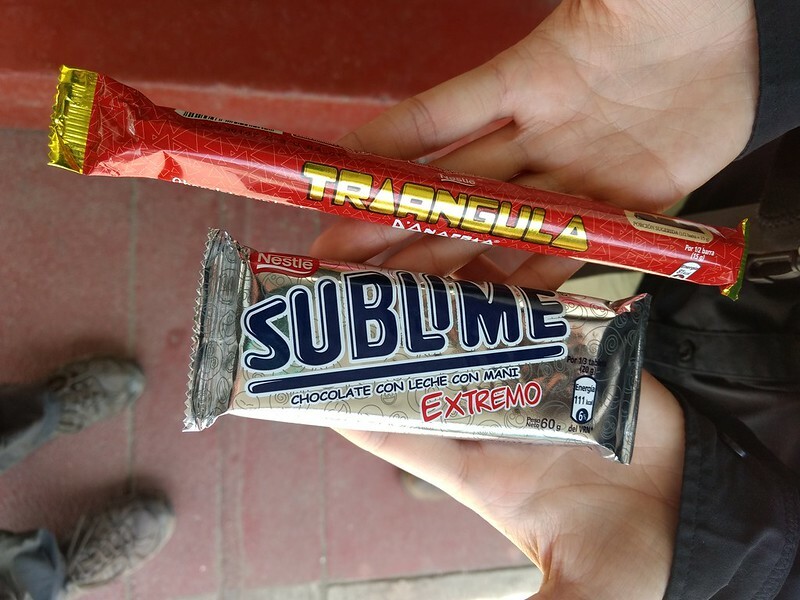 We stocked up on ‘supplies’ (read: life-saving chocolate) in a general store near the main square, and then caught a van headed toward Hidroeléctrica for 10 soles. The road was hot, dry, and dusty, so we were grateful to be in an air-conditioned van, despite the bumps and ruts. After half an hour, we passed an odd geological feature that our driver insisted was a natural cave in the wall. Ten minutes later, we passed by the hydroelectric dam compound that Hidroeléctrica is named after. 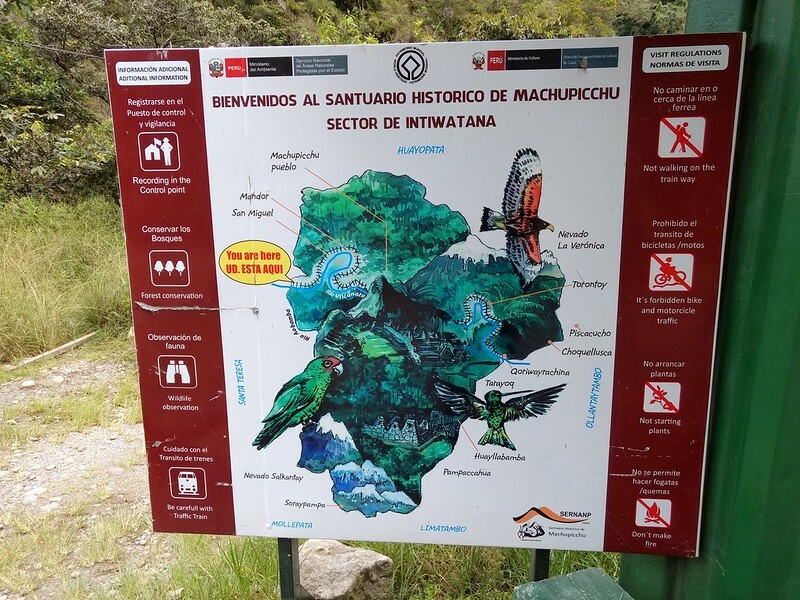 Then came our stop, marked only by a sign welcoming us to the Hydroelectric Center Machu Picchu. From here, we had to continue the rest of the way on foot. 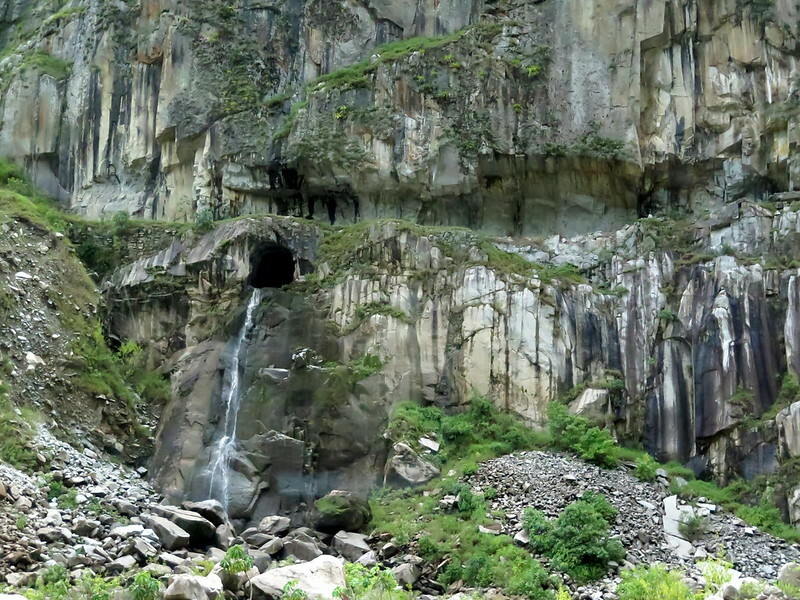 The mysterious ‘natural’ cave near Hidroeléctrica. 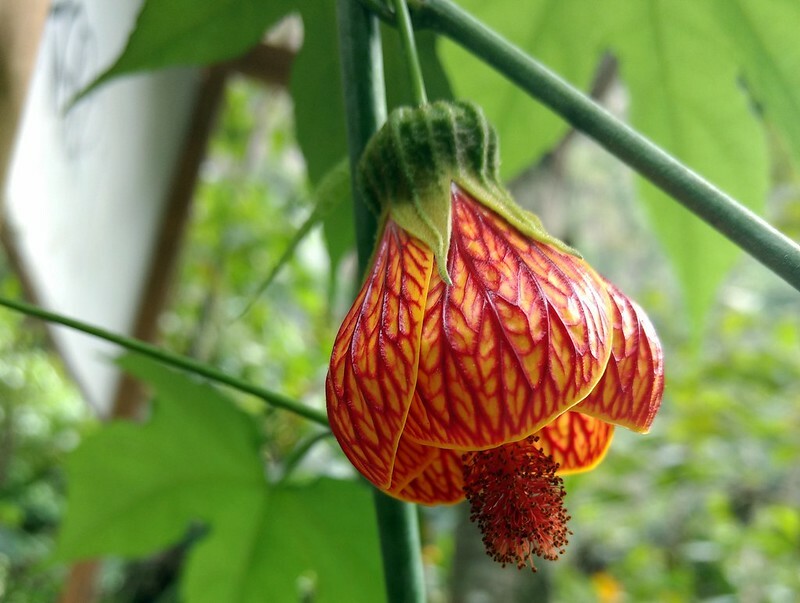 Any idea on what it is? With the exception of the towering peaks around us, this area looked a lot like a scene from Southern California’s dusty lowland bush. It was also not well signed, so we set off on the largest trail we could find in the direction of Hidroeléctrica and hoped for the best. Thankfully, within minutes we encountered a guard post that marked the entrance to Machu Picchu Historic Sanctuary. The guards here checked our passports, wrote down our passport numbers and names, pointed to the park rules, and then genially waved us on our way. I noticed the rules included “Not walking on the train way” and “Not starting plants”. Given that we’re literally about to walk the track path to Machu Picchu, I can guess that they’re poorly enforced. 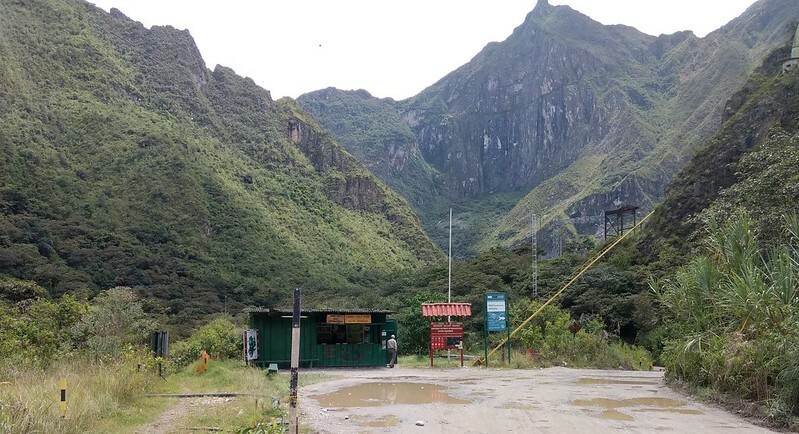 The guard station at the entry to Machu Picchu’s Sanctuary and the start of the railway tracks. Go here to register! The do and do nots of the sanctuary. I see that walking on the train way isn’t allowed; I hope they just mean walking directly on the tracks. We hiked in the direction the guards waved and found the start of the railway track, a mix of tourists making the walk and vendors selling last-minute snacks and goods. There was even a full-service restaurant, just off to the right of the track. We had our snacks so we kept hiking, and within a few minutes of following the track it was just us. We may have taken a wrong turn, because after half an hour our tracks dead-ended into a wall. Above us there was an ominous, handpainted “no entry” sign. We backtracked and asked a guard on duty nearby what direction to take. He pointed us to the dead end, and off to the left, where there was a trail hidden in the underbrush. I’m proud to say that despite several websites stating that this hike had only one trail, we managed to find the dead-end track AND take the alternate route up the hill. TAKE THAT, BEATEN TRACK! We followed the trail, skirting the “no entry” area that consisted of someone’s wooden shack and farm plots. It quickly got steeper, until we found ourselves climbing over rocks and clinging to branches to continue up the hill. Twenty minutes later and panting, we emerged from the hillside onto another set of railroad tracks. There were several more people walking along these tracks, so we guessed that this was the correct way to Machu Picchu. 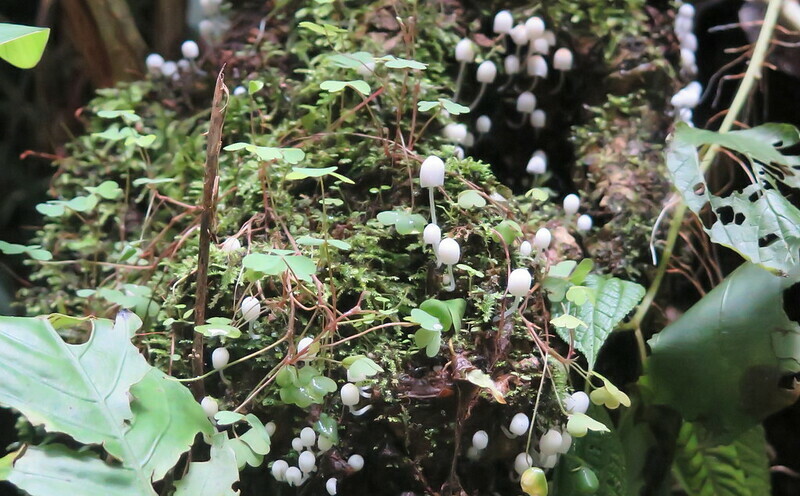 Small white mushrooms grow on a stump along the trail. From here on out the hike was pretty straightforward, marked by a few odd scenes along the trail and some interesting plants and animals. The first half was hard-packed earth that made the going easy. We passed wild avocado and guava trees, and occasionally saw farms cultivating bananas. Huge green macaws flew from tree to tree, squawking loudly, but were impossible to photograph. About an hour in, we crossed a train bridge using a wobbly, steel-sheet pedestrian path to the side of the tracks. Looking over the railing, we watched the brown water of the river move lazily below us. It looked like the rainy season was carrying off quite a bit of dirt. Crossing the rail brige over the river: mostly safe, except for some wobble in the steel sheets and a couple of rust pits. But she seems stable enough! At halfway, rocks and gravel replaced the dirt along the track and the hike got harder. While in some places the trail was wide enough that we could avoid the gravel and walk on the dirt or grass, in most places the path was too narrow. We found ourselves slipping on the gravel, twisting our feet and ankles this way and that. Passing trains also became more frequent, accompanied by conductors shouting at us to get out of the way and scowling. I get it, but maybe we wouldn’t be here if the train didn’t cost as much as a night’s stay in a five-star hotel. On the upside, guess who met up with along the track? Yep! It’s Ashley and Kyle! They had managed to hike Llacapata and were now on their way to Machu Picchu as well. The train passes us on the trail carrying a dour, shouting conductor. He’ll shout and frown even when you’re far off the track on the side of the trail. Near the end of the hike, things started to get a little surreal. 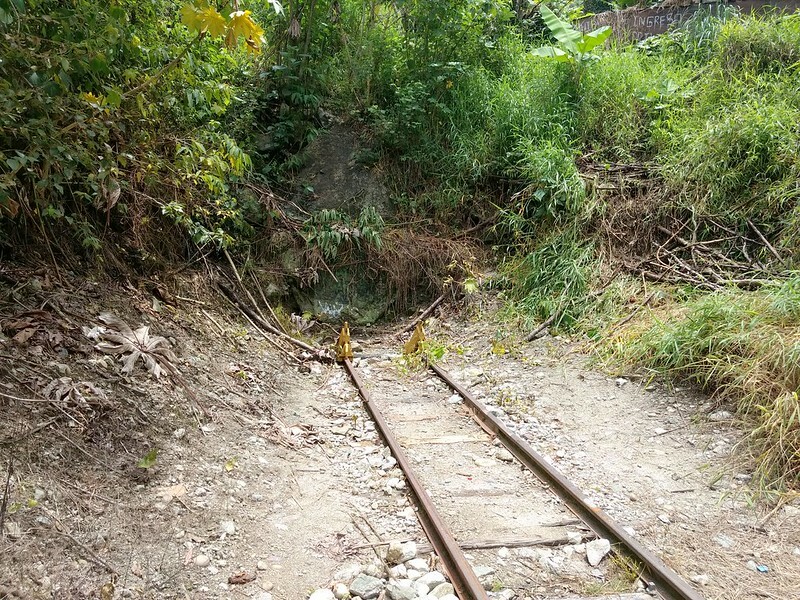 The path widened to include four tracks and included a grassy knoll in the center. 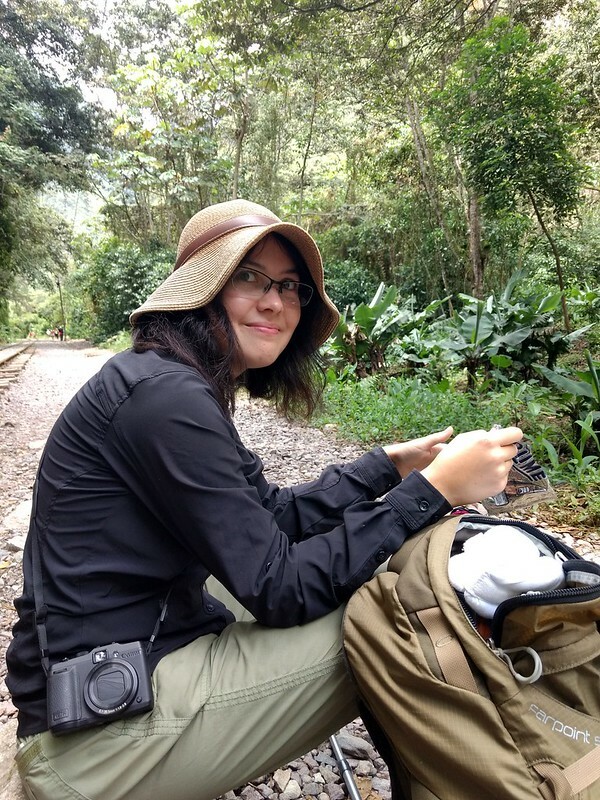 We stopped on some nearby rocks to eat our chocolate bars, and noticed that there was a whole botanical garden, restaurant, and lodge here alongside the tracks. Again, the only way to reach this place is by walking along the train tracks, so this establishment has to get all of its visitors from people like us. This is a lodge, garden, and (I think) restaurant that seems to just serve visitors hiking the railway. Maybe the train stops here too, but that seems unlikely. Just outside the garden there was also a signpost indicating destinations and distances. 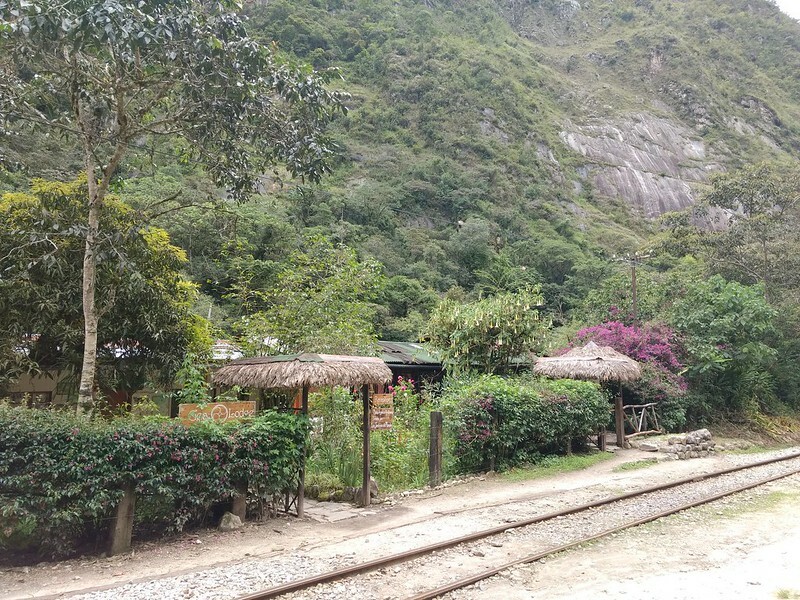 According to it, we had covered 7 of the 13 kilometers to Aguas Calientes. We had 4 more to go. Look, Cusco is only 115 km! 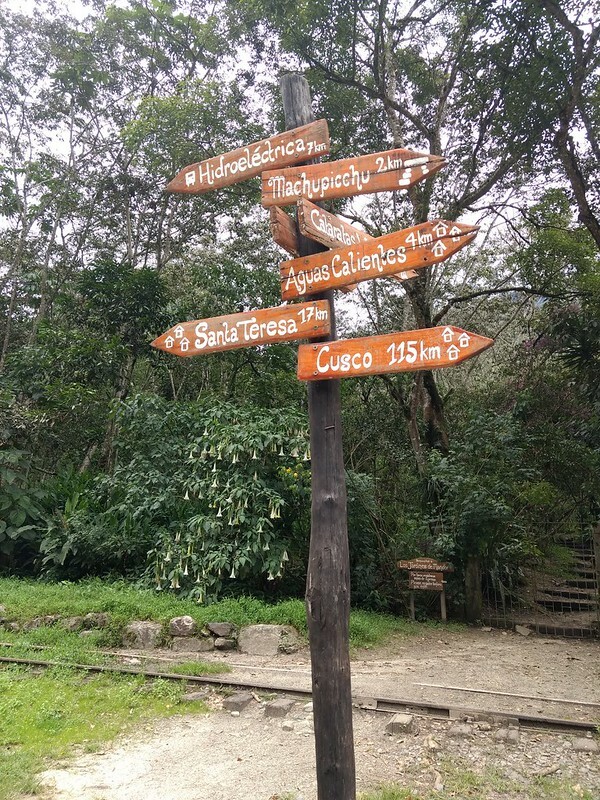 More importantly, don’t conflate Machu Picchu and Aguas Calientes, or you’ll have an extra 2 km to hike that you didn’t account for. The last part of the hike seemed to stretch on forever as exhaustion weighed on us. 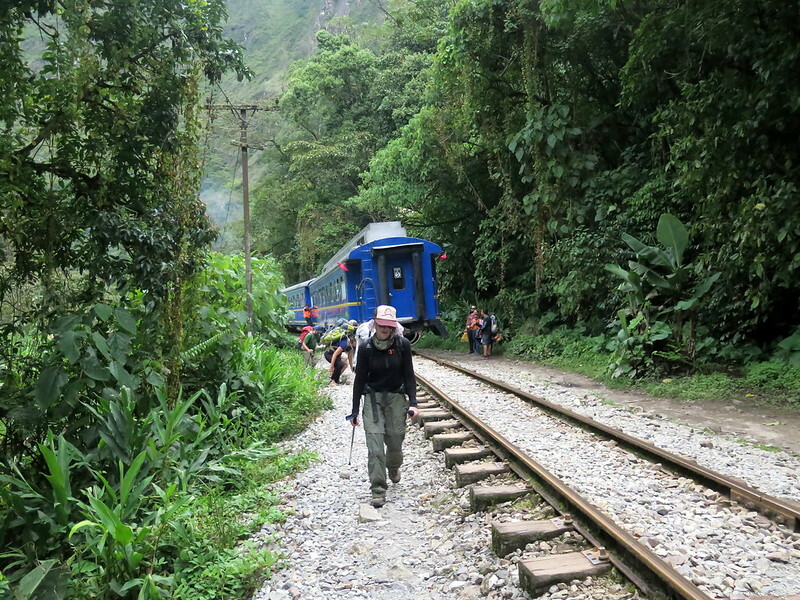 After two more kilometers on the tracks, we reached the train station and transitioned to hiking on a road. We passed the offshoot to Machu Picchu, and finally we could see the town. The sky was threatening rain again, so we picked up our pace and reached the town’s edge in twenty minutes. Twenty minutes of stopping at hotels and asking for prices, and we finally we found a room we could afford just as the first raindrops came down. A view of Aguas Calientes, the end of our hike for today. 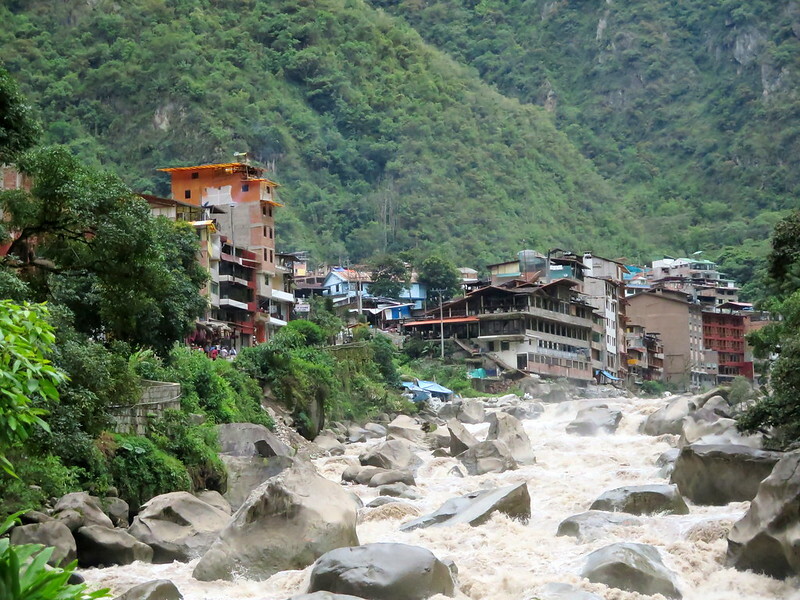 I won’t spend much breath on Aguas Calientes, since it wasn’t a place we liked much. Like Cusco, it was suffering the effects of the low season, and desperation for tourist dollars and two-fold inflated prices made the town seem even more bleak. We did manage to find the doctor, who told us that while Aguas does have an X-ray machine, it’s a small one that’s only for examining hands and feet, so we would have to seek a doctor in Cusco. He seemed overworked, but gave us a weary smile and told me, “If you were able to walk here, you’re more or less ok.” I’ll take his word for it, since we tackle Machu Picchu tomorrow. 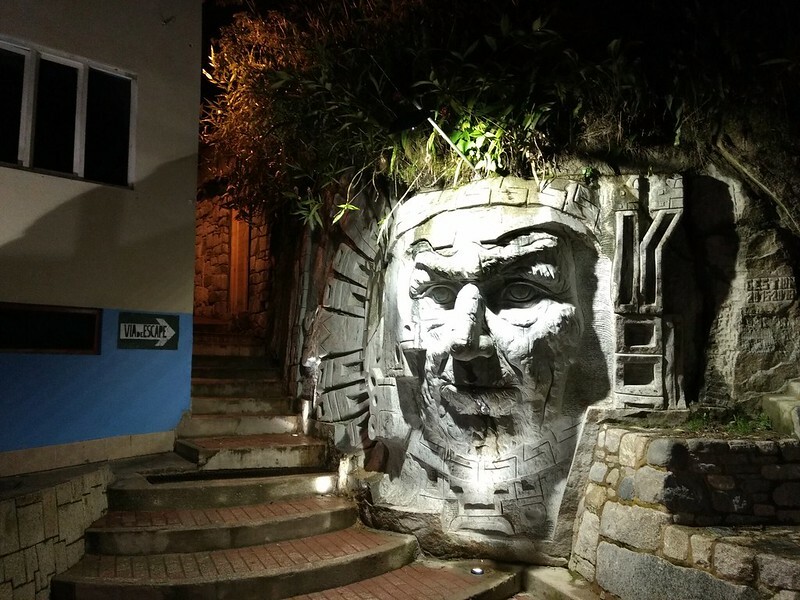 An Incan-styel sculpture in Aguas Calientes. It’s a tourist town. The best thing I can say about it is that it has an interesting layout, spread across two rivers and connected by several aerial bridges.